Reverend DaRon JeSie Morris was born in the summer of 1968 to the late Reverend James R. and Sallie M. Morris (Redd) and was reared in Henry County, Virginia. Also born to that blessed union were Morris’ older brother, Derrick JaSal and younger sister, DaManda JaMese. Pastor Morris accepted Jesus Christ as his Lord and Savior at a young age. He joined and was baptized at the Mayo Missionary Baptist Church under the Pastoral Leadership of the late Reverend A.O. Smith. In 1983, Pastor Morris’ father was installed as pastor of the Star of Bethlehem Missionary Baptist Church in Bassett, Va. Pastor Morris joined Star of Bethlehem and served in many capacities under the Pastoral Leadership of his father. In the Fall of 1995, Morris was united in holy matrimony to the former Tiffany Renee Draper. God has blessed this union with three beautiful children, two daughters, JeSani Treneé, and JaRiah Terreé; and one son, Jezekiah TaRon. 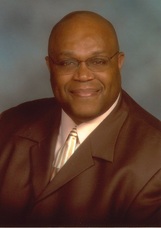 Pastor Morris’ academic and career pursuit includes his college preparatory work with an Advanced Diploma from George Washington Carver High School; a Bachelor’s Degree in Religious Studies and a Bachelor’s Degree in Sociology from the University of Virginia in Charlottesville, Virginia. While attending UVA, he served as a musician for the UVA Gospel Choir, called “Black Voices.” Morris has also completed coursework towards a Master’s Degree in Pastoral Counseling from Liberty University in Lynchburg, Virginia. In the Spring of 1997, Morris accepted the LORD’s call into the GOSPEL Ministry and was licensed to preach by Star of Bethlehem Missionary Baptist Church on March 1, 1997, under his father and pastor, Reverend James R. Morris. While at Star of Bethlehem MBC, Morris served as an Associate Minister, Director of Christian Education, and Musician for the Youth Choir. In the Summer of 1998, Morris was called by the Mount Sinai Missionary Baptist Church in Eden, North Carolina. In August 1998, “His 30th Birthday”, Morris began serving Mt. Sinai as Pastor-elect. He was ordained by the Ordination Council of the Smith River Missionary Baptist Association on September 12, 1998 and was installed on November 1, 1998, as the 18th Pastor of the Historic Church. For over a decade, Reverend Morris has served the Mount Sinai Church Family with integrity, faithfulness, and charity. Pastor Morris’ ministry theme is founded in Romans 12:2. “Be Ye Transformed By the Renewing Of Your Mind.” Under his leadership, Mt. Sinai continues to be the church that Loves God, Hates Sin, and Shows Love knowing that The Best is Still Yet to Come! !